American universities produce the best software engineers, IT managers and programmers in the world, but many can’t find a job or have taken pay cuts in recent years. Because there are too many software engineers in India, and not enough in the US. Because India is churning out 1 million new engineers every year, whereas the industry requires only about 200,000 of them. Because the “average” fresh software engineering graduate in India can barely program, and 40% of them fail the Fizz Buzz test (as per actual data we’ve collected over the last 2 years), whereas the average software engineering graduate in the US is likely to be much better (as per my anecdotal data). Why is the median salary of a software engineer in India around Rs 3.6 Lakh, whereas in US it is $71k(ie Rs 44Lakh), which is nearly 12.4 times that of India, but the cost of living or equivalent salary of US is considered to be only 4 to 5 times that of Indian salary? Which brings me to the one bright hope in recent years that the abominable H-1B Visa system would be reformed. In January California Congressman Zoe Lofgren introduced the High-Skilled Integrity and Fairness Act of 2017, H.R. 670, which gives priority for market-based allocation of visas to companies willing to pay 200% of a wage calculated by survey. The bill also eliminates the category of lowest pay, and raises the salary level at which H-1B dependent employer are exempt from non-displacement and recruitment attestation requirements to greater than $130,000. My legislation refocuses the H-1B program to its original intent – to seek out and find the best and brightest from around the world, and to supplement the US workforce with talented, highly paid, and highly skilled workers, who help create jobs here in America, not replace them. H.R. 670 was introduced Jan. 24 and was almost immediately buried by Congressional leadership. The H1-B reform bill calls for more than doubling the minimum salary of H-1B Vjsa holders to $130,000, among other things. Well, at least they noticed in India that American jobs won’t be saved from lower wage foreign workers. Guest workers are highly concentrated in STEM occupations. Guest workers were 14.2 percent of the computer and mathematical science workforce in the United States; 6.7 percent of the architecture and engineering workforce; and 10.5 percent of the life, physical, and social science workforce in 2016. Further, guest workers made up 24.9 percent of software developers, 13.3 percent of computer programmers, 17.4 percent of computer hardware engineers, 20.6 percent of computer and information research scientists, plus 14.6 percent of mathematicians, statisticians and miscellaneous math occupations in the United States in 2016. The highest concentration of guest workers in STEM occupations was among medical scientists and life scientists where guest workers were 28.5 percent of the workforce in 2016. All of these guest workers are employed under a variety of skilled worker visas, including the B, H-1B, L-1, L-2, O, and OPT. 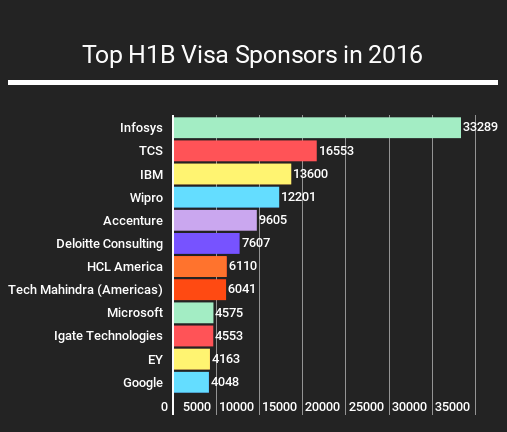 The H-1B Visa program almost entirely benefits large firms like Google, Facebook and their ilk. Paperwork requirements are fierce and smaller companies can not afford the effort. Big companies set up departments and systems to make firing Americans and replacing them – easy and profitable! Or, they contract with firms like Infosys.